I am an artist based in Edinburgh. I have always loved drawing and painting. One afternoon when I was about 4 years old my mum caught me drawing on my bedroom walls .... apparently I'd run out of drawing paper! My Art Career - I attended Edinburgh College of Art from 1987-92 where I gained an honours and post graduate degree as well as two additional awards (see below). From 1993-1994 I gained a second post graduate degree plus the 'Most Promising Teacher of Art & Design Award' at The Moray House Institute of Education, I thereafter taught Art for 4 years at Madras College, St Andrews. In 1998 I left teaching to paint full time. Since becoming a full time artist I have enjoyed numerous solo shows and various commissions both in the UK and abroad (see details below). 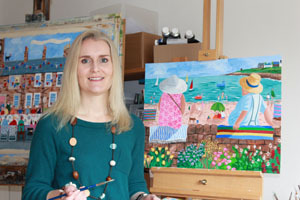 Everyday life - I live in Edinburgh with my husband who is at work all day, my son and daughter who are at school all day and my wire-haired fox terrier who is asleep under my easel all day. This is my precious painting time. We spend quite a bit of our spare time in the seaside village of Elie in Fife where my husband golfs, my children play tennis, I people-watch and Brodie dog -watches. It's a good balance of city / country life and both places give me a constant flow of ideas for my work. 2000 - 2006 annual solo shows at Elie & Earlsferry Town Hall..
2017 - Solo show at The Blue Easel Gallery, Edinburgh. - Plus many others, as well as private commissions for clients all over the UK, Hong Kong, Australia and the U.S.A.
My studio at the bottom of the garden.